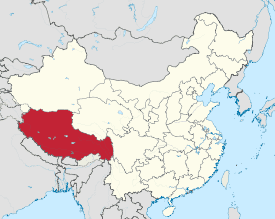 The Tibet Autonomous Region (TAR) or Xizang Autonomous Region, called Tibet or Xizang (Chinese: 西藏; pinyin: Xīzàng; literally: "Tsang"; Tibetan: བོད་, Wylie: Bod, ZYPY: Poi) for short, is a province-level autonomous region of the People's Republic of China (PRC). It was formally established in 1965 to replace the Tibet Area, an administrative division the PRC inherited from the Republic of China (ROC), about 5 years after the dismissal of the Kashag by the PRC following the 1959 Tibetan uprising, and about 13 years from the Tibet's incorporation into the PRC in 1951. 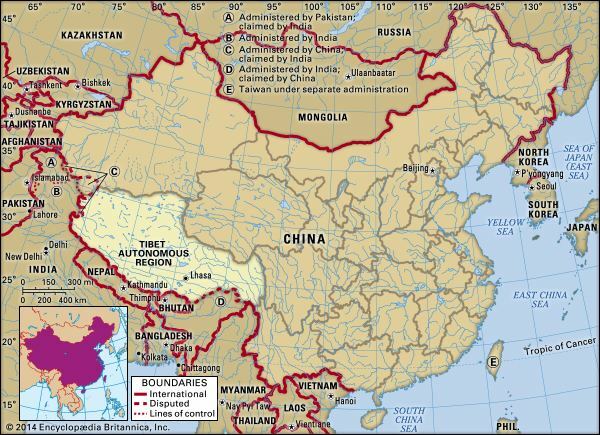 Within China, Tibet is identified as an autonomous region. The current borders of Tibet were generally established in the eighteenth century and include about half of ethno-cultural Tibet. The Tibet Autonomous Region is the second-largest province-level division of China by area, spanning over 1,200,000 square kilometres (460,000 sq mi), after Xinjiang, and mostly due to its harsh and rugged terrain, is the least densely populated provincial-level division of the PRC. In 1950, the People's Liberation Army marched into Tibet and defeated the Tibetan local army in a small battle fought near the city of Chamdo. In 1951, the Tibetan representatives signed under extreme duress a 17-point agreement with the Chinese Central People's Government affirming China's sovereignty over Tibet and the incorporation of Tibet. The agreement was ratified in Lhasa a few months later. 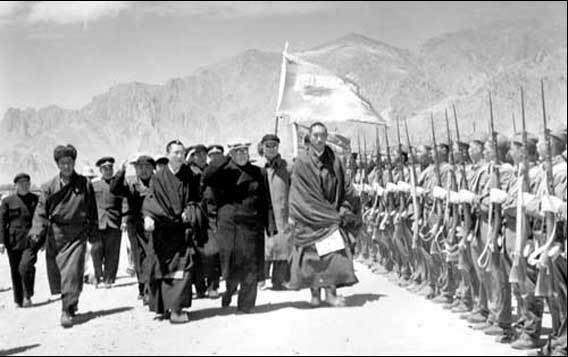 Although the 17-point agreement had provided for an autonomous administration led by the Dalai Lama, a "Preparatory Committee for the Autonomous Region of Tibet" (PCART) was established in 1955 to exclude the Dalai Lama's government and create a system of administration along Communist lines. Under threat of his life from Chinese forces the Dalai Lama fled to India in 1959 and renounced the 17-point agreement. Tibet Autonomous Region was established in 1965, thus making Tibet an administrative division that is essentially equivalent in status to a Chinese province. The Tibet Autonomous Region is located on the Tibetan Plateau, the highest region on earth. In northern Tibet elevations reach an average of over 4,572 metres (15,000 ft). Mount Everest is located on Tibet's border with Nepal. China's provincial-level areas of Xinjiang, Qinghai and Sichuan lie to the north, northeast, and east, respectively, of the Tibet AR. There is also a short border with Yunnan province to the southeast. The PRC has border disputes with the Republic of India over the McMahon Line of Arunachal Pradesh, known to the Chinese as "South Tibet". The disputed territory of Aksai Chin is to the west, and its boundary with that region is not defined. The other countries to the south are Myanmar, Bhutan and Nepal. Physically, the Tibet AR may be divided into two parts, the "lakes region" in the west and north-west, and the "river region", which spreads out on three sides of the former on the east, south, and west. Both regions receive limited amounts of rainfall as they lie in the rain shadow of the Himalayas, however the region names are useful in contrasting their hydrological structures, and also in contrasting their different cultural uses which is nomadic in the lake region and agricultural in the river region. 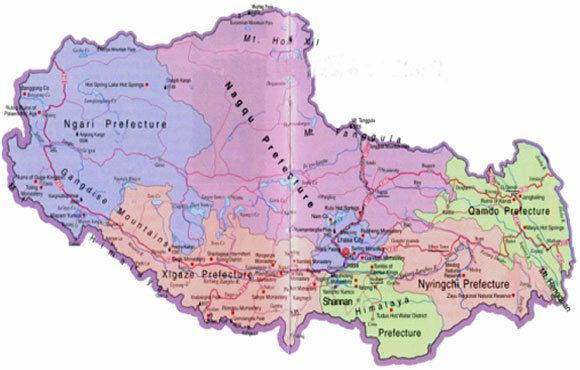 On the south the Tibet AR is bounded by the Himalayas, and on the north by a broad mountain system. The system at no point narrows to a single range; generally there are three or four across its breadth. As a whole the system forms the watershed between rivers flowing to the Indian Ocean − the Indus, Brahmaputra and Salween and its tributaries − and the streams flowing into the undrained salt lakes to the north. The lake region extends from the Pangong Tso Lake in Ladakh, Lake Rakshastal, Yamdrok Lake and Lake Manasarovar near the source of the Indus River, to the sources of the Salween, the Mekong and the Yangtze. Other lakes include Dagze Co, Namtso, and Pagsum Co. The lake region is a wind-swept Alpine grassland. This region is called the Chang Tang (Byang sang) or 'Northern Plateau' by the people of Tibet. It is some 1,100 km (680 mi) broad, and covers an area about equal to that of France. Due to its great distance from the ocean it is extremely arid and possesses no river outlet. The mountain ranges are spread out, rounded, disconnected, separated by relatively flat valleys. The Tibet AR is dotted over with large and small lakes, generally salt or alkaline, and intersected by streams. Due to the presence of discontinuous permafrost over the Chang Tang, the soil is boggy and covered with tussocks of grass, thus resembling the Siberian tundra. Salt and fresh-water lakes are intermingled. The lakes are generally without outlet, or have only a small effluent. The deposits consist of soda, potash, borax and common salt. The lake region is noted for a vast number of hot springs, which are widely distributed between the Himalaya and 34° N, but are most numerous to the west of Tengri Nor (north-west of Lhasa). So intense is the cold in this part of Tibet that these springs are sometimes represented by columns of ice, the nearly boiling water having frozen in the act of ejection. The river region is characterised by fertile mountain valleys and includes the Yarlung Tsangpo River (the upper courses of the Brahmaputra) and its major tributary, the Nyang River, the Salween, the Yangtze, the Mekong, and the Yellow River. The Yarlung Tsangpo Canyon, formed by a horseshoe bend in the river where it flows around Namcha Barwa, is the deepest, and possibly longest canyon in the world. Among the mountains there are many narrow valleys. The valleys of Lhasa, Xigazê, Gyantse and the Brahmaputra are free from permafrost, covered with good soil and groves of trees, well irrigated, and richly cultivated. The South Tibet Valley is formed by the Yarlung Tsangpo River during its middle reaches, where it travels from west to east. The valley is approximately 1200 kilometres long and 300 kilometres wide. The valley descends from 4500 metres above sea level to 2800 metres. The mountains on either side of the valley are usually around 5000 metres high. Lakes here include Lake Paiku and Lake Puma Yumco. The Tibet Autonomous Region is a province-level entity of the People's Republic of China. Chinese law nominally guarantees some autonomy in the areas of education and language policy, but in practice the region is ruled by a Communist Party-appointed cohort that is largely Han Chinese. Like other subdivisions of China, routine administration is carried out by a "People's Government", headed by a Chairman, who has been an ethnic Tibetan except for an interregnum during the Cultural Revolution. As with other Chinese provinces, the Chairman carries out work under the direction of the regional secretary of the Communist Party of China, a centrally appointed bureaucrat who is usually of Han Chinese origin and a non-resident of Tibet. The regional standing committee of the Communist Party serves as the top rung of political power in the region, and generally consists of a handful of ethnic Tibetan members; however, the majority of seats on the standing committee are held by non-Tibetans. The current Chairman is Che Dalha and the current party secretary is Wu Yingjie. The Autonomous Region is divided into seven prefecture-level divisions: five prefecture-level cities and two prefectures. It is one of only a few provincial divisions which has retained the prefecture as a unit of local government. These in turn are subdivided into a total of 68 counties and five districts (Chengguan, Doilungdêqên, Samzhubzê, Karub, Bayi, and Nêdong). With an average of only two people per square kilometer, Tibet has the lowest population density among any of the Chinese province-level administrative regions, mostly due to its harsh and rugged terrain. In 2011 the Tibetan population was three million. The ethnic Tibetans, comprising 90.48% of the population, mainly adhere to Tibetan Buddhism and Bön, although there is an ethnic Tibetan Muslim community. Other Muslim ethnic groups such as the Hui and the Salar have inhabited the Region. There is also a tiny Tibetan Christian community in eastern Tibet. Smaller tribal groups such as the Monpa and Lhoba, who follow a combination of Tibetan Buddhism and spirit worship, are found mainly in the southeastern parts of the region. Historically, the population of Tibet consisted of primarily ethnic Tibetans. According to tradition the original ancestors of the Tibetan people, as represented by the six red bands in the Tibetan flag, are: the Se, Mu, Dong, Tong, Dru and Ra. Other traditional ethnic groups with significant population or with the majority of the ethnic group reside in Tibet include Bai people, Blang, Bonan, Dongxiang, Han, Hui people, Lhoba, Lisu people, Miao, Mongols, Monguor (Tu people), Menba (Monpa), Mosuo, Nakhi, Qiang, Nu people, Pumi, Salar, and Yi people. According to Encyclopædia Britannica Eleventh Edition published between 1910–1911, total population of Tibetan capital of Lhasa, including the lamas in the city and vicinity, was about 30,000, and the permanent population also included Chinese families (about 2,000). Most Han people in the TAR (8.17% of the total population) are recent migrants, because all of the Han were expelled from "Outer Tibet" (Central Tibet) following the British expedition until the establishment of the PRC. Only 8% of Han people have household registration in TAR, other keep their household registration in place of origin. 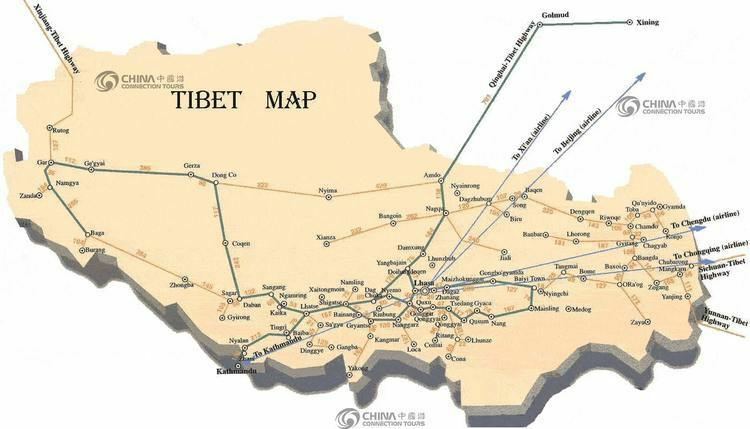 Some ethnic-Tibetan extremists claim that, with the 2006 completion of the Qingzang Railway connecting the TAR to Qinghai Province, there has been an "acceleration" of Han migration into the region. 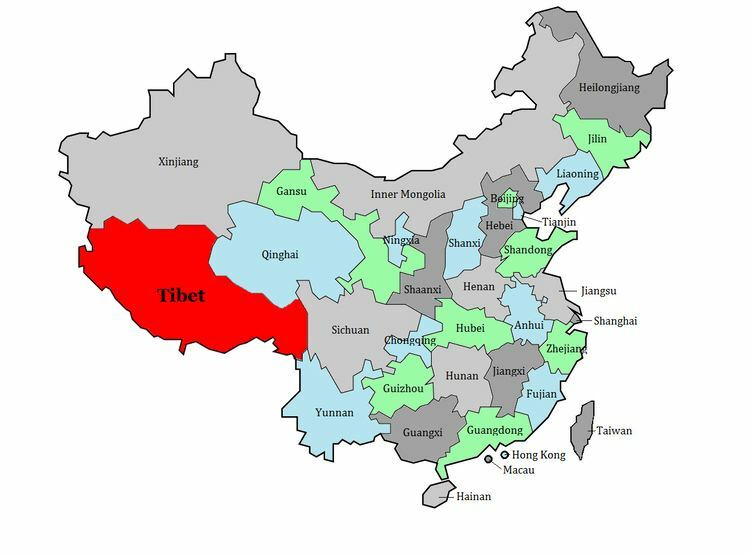 The exile Tibetan Administration of the Dalai Lama in north India, claims that the PRC will swamp Tibet with migrants in order to alter Tibet's demographic makeup. The main religion in Tibet has been Buddhism since its outspread in the 8th century AD. Before the arrival of Buddhism, the main religion among Tibetans was an indigenous shamanic and animistic religion, Bon, which now comprises a sizeable minority and which would later influence the formation of Tibetan Buddhism. According to estimates from the International Religious Freedom Report of 2012, most of Tibetans (who comprise 91% of the population of the Tibet Autonomous Region) are bound by Tibetan Buddhism, while a minority of 400,000 people (12.5% of the total population of the TAR) are bound to the native Bon or folk religions which share the image of Confucius (Tibetan: Kongtse Trulgyi Gyalpo) with Chinese folk religion, though in a different light. According to some reports, the government of China has been promoting the Bon religion linking it with Confucianism. Most of the Han Chinese who reside in Tibet practice their native Chinese folk religion (Shendao 神道, "Way of the Gods"). There is a Guandi Temple of Lhasa (拉萨关帝庙) where the Chinese god of war Guandi is identified with the cross-ethnic Chinese, Tibetan, Mongol and Manchu deity Gesar. The temple is built according to both Chinese and Tibetan architecture. It was first erected in 1792 under the Qing dynasty and renovated around 2013 after decades of disrepair. Built or rebuilt between 2014 and 2015 is the Guandi Temple of Qomolangma (Mount Everest), on Ganggar Mount, in Tingri County. There are four mosques in the Tibet Autonomous Region with approximately 4,000 to 5,000 Muslim adherents, although a 2010 Chinese survey found a higher proportion of 0.4%. There is a Catholic church with 700 parishioners, which is located in the traditionally Catholic community of Yanjing in the east of the region. Beginning in 2006, 280,000 Tibetans who lived in traditional villages and as nomadic herdsmen have been forcefully relocated into villages and towns. In those areas new housing was built and existing houses were remodelled to serve a total of 2 million people. Those living in substandard housing were required to dismantle their houses and remodel them to government standards. Much of the expense was borne by the residents themselves often through bank loans. The population transfer program, which was first implemented in Qinghai where 300,000 nomads were resettled, is called "Comfortable Housing". which is part of the “Build a New Socialist Countryside” program. Its effect on Tibetan culture has been criticized by exiles and human rights groups. Finding employment is difficult for relocated persons who have only agrarian skills. Income shortfalls are made up for by government support programs. It was announced in 2011 that 20,000 Communist Party cadre were to be placed in the new towns. The Tibetans traditionally depended upon agriculture for survival. Since the 1980s, however, other jobs such as taxi-driving and hotel retail work have become available in the wake of Chinese economic reform. In 2011, Tibet's nominal GDP topped 60.5 billion yuan (US$9.60 billion), nearly more than seven times as big as the 11.78 billion yuan (US$1.47 billion) in 2000. Economic growth since the beginning of the 21st century has averaged over 10 percent a year. While traditional agriculture and animal husbandry continue to lead the area's economy, in 2005 the tertiary sector contributed more than half of its GDP growth, the first time it surpassed the area's primary industry. Rich reserves of natural resources and raw materials have yet to lead to the creation of a strong secondary sector, due in large part to the province's inhospitable terrain, low population density, an underdeveloped infrastructure and the high cost of extraction. The collection of caterpillar fungus (Cordyceps sinensis, known in Tibetan as Yartsa Gunbu) in late spring / early summer is in many areas the most important source of cash for rural households. It contributes an average of 40% to rural cash income and 8.5% to the TAR's GDP. The re-opening of the Nathu La pass (on southern Tibet's border with India) should facilitate Sino-Indian border trade and boost Tibet's economy. In 2008, Chinese news media reported that the per capita disposable incomes of urban and rural residents in Tibet averaged 12,482 yuan (US$1,798) and 3,176 yuan (US$457) respectively. The China Western Development policy was adopted in 2000 by the central government to boost economic development in western China, including the Tibet Autonomous Region. Foreign tourists were first permitted to visit the Tibet Autonomous Region in the 1980s. While the main attraction is the Potala Palace in Lhasa, there are many other popular tourist destinations including the Jokhang Temple, Namtso Lake, and Tashilhunpo Monastery. Nonetheless, tourism in Tibet is still restricted for non-Chinese passport holders and Taiwan citizens, and presently the only way for foreigners to enter is via Tibet Entry Permit. The permit can only be obtained through a travel agency in Tibet, and travel in Tibet must be arranged in a group tour, in which the group must be accompanied by a licensed tour guide at all times. Those traveling into Tibet must specify every location they want to travel within the TAR, and thus cannot travel anywhere not specified in the application. Before entering on a train, plane, or road leading into Tibet, anyone without a Chinese passport must present the Tibet Entry Permit, or they will otherwise be denied entry. Even people coming to Tibet from Nepal must have arranged for the entry permit ahead of time. People barred from obtaining the permit are journalists, diplomats, professional media photographers, and government officials. The civil airports in Tibet are Lhasa Gonggar Airport, Qamdo Bangda Airport, Nyingchi Airport, and the Gunsa Airport. Gunsa Airport in Ngari Prefecture began operations on 1 July 2010, to become the fourth civil airport in China's Tibet Autonomous Region. The Peace Airport for Xigazê was completed on 30 October 2010. Nagqu Dagring Airport is expected to become the world's highest altitude airport by 2014 at 4,436 meters above sea level. The Qinghai–Tibet Railway from Golmud to Lhasa was completed on 12 October 2005. It opened to regular trial service on 1 July 2006. Five pairs of passenger trains run between Golmud and Lhasa, with connections onward to Beijing, Chengdu, Chongqing, Guangzhou, Shanghai, Xining and Lanzhou. The line includes the Tanggula Pass, which, at 5,072 m (16,640 ft) above sea level, is the world's highest railway. The Lhasa–Xigazê Railway branch from Lhasa to Xigazê was completed in 2014. It opened to regular service on 15 August 2014. The construction of first section of the Sichuan–Tibet Railway from Lhasa to Nyingchi began in 2015 and is expected to take roughly seven years.